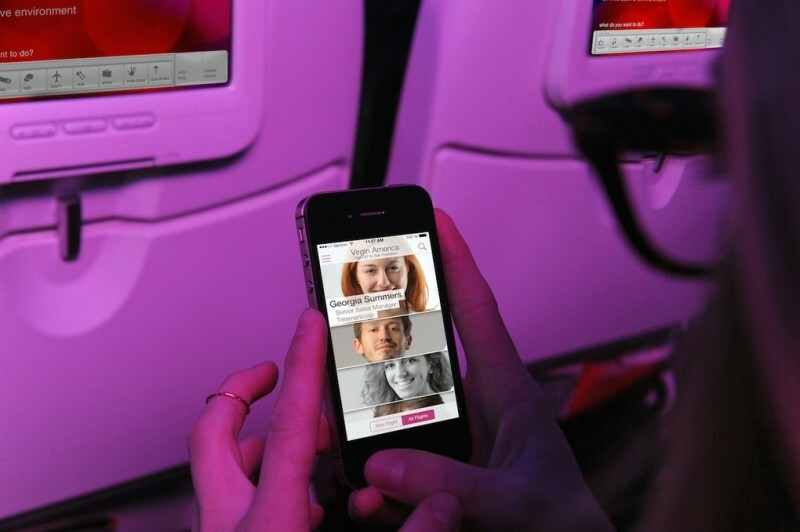 Virgin America recently launched a social network designed to connect airline passengers with others during their flight. The company partnered with location-aware social app Here On Biz to build the app which will use Gogo’s in-flight Wi-Fi as well as an API that will determine a plane’s location in the sky. We’re told that those using the app will be able to send messages to others on the same flight, at their destination or even people flying on other Virgin America planes. Users will be able to log in using their LinkedIn credentials. In a statement on the matter, Here On Biz CEO Nick Smoot said the partnership allows flyers to take advantage of those serendipitous travel moments where people with complementary business interests are in the same place at the same time — even if that place is on a plane somewhere 35,000 feet above the US. True enough, the service is likely to cater to business-minded individuals more so than those just looking to chit-chat between destinations. Using LinkedIn, users will be able to connect with people they may not have realized were on the same flight or even find completely new contacts. In the event you simply want to be left alone during your flight, you can adjust the privacy settings to limit or block visibility to others onboard. Virgin America said the idea for the app came about via a 2013 survey of Virgin America's most frequent flyers in New York, Dallas and San Francisco.